Since 2012 Pembroke College has assembled an extraordinary collection of manuscripts, books and artwork by and about Ted Hughes, our greatest artist since Thomas Gray. We've now been given the chance to acquire the ink-stained writing table and farmhouse chair where he wrote many of his greatest poems. We need your help to bring them to Pembroke and inspire future generations of poets. I'm Mark Wormald, Fellow in English at Pembroke since 1992, and a specialist on Ted Hughes. And I'm Patricia Aske, the College Librarian, proud custodian of the Ted Hughes material. Why is pembroke the right home for ted hughes’s Desk and chair? In 2010 Pembroke hosted an international conference on Ted Hughes (1930-1998, Pembroke 1951) whose work we'd honoured a decade earlier with stained glass windows devoted to his poems. In 2011, lines from one of the poems in our library windows, 'That Morning', provided the inscription for the memorial plaque to Hughes at Poets' Corner. In 2012, we began acquiring a collection of manuscript poems, printed books, original artwork, letters, ephemera by and about one of the twentieth century's greatest poets and writers. That collection is still growing. In March 2018, assisted by a grant from the Friends of the National Libraries, we bought at auction a remarkable and moving copy of a rare edition of Animal Poems, printed in 1967 by a small press in Devon. In 1980 Hughes gave it as a Christmas present to his son Nicholas. It contains nine manuscript poems, all of them about fish or fishing, the passion they shared. Each tells a remarkable story, months or years -- in one case fifteen years -- before any other reader saw them. One, about pike fishing on a Devon reservoir, remains unpublished. 'That Morning' is there. So is his masterpiece 'Pike', and 'An Otter', inspired by Hughes's own youthful love of Henry Williamson's classic Tarka the Otter. The morning after the auction, in late March, Bonhams contacted Mark. 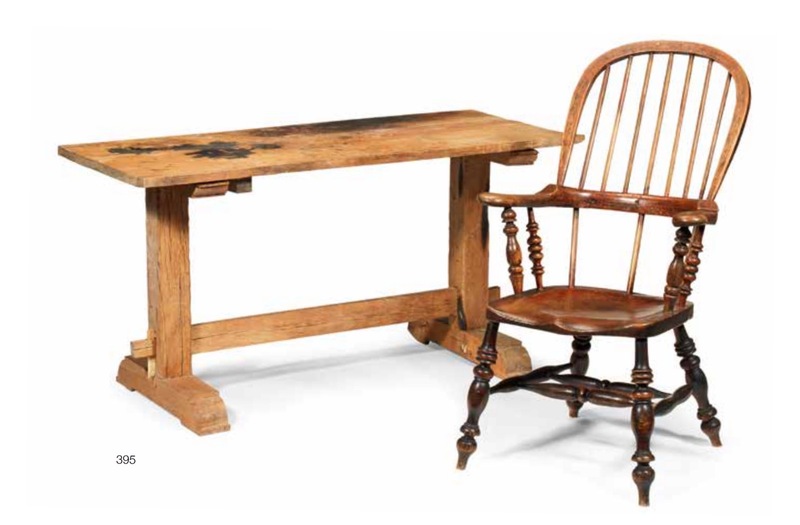 Ted Hughes's ink-stained oak refectory table and wooden armchair, at which he wrote all these poems and many more, had not sold. One Hughesian had already written to Mark before the sale saying that he had spotted in those stains two skulls, a shark, and a jaguar head. Bonhams were seeking a good home at a realistic price. Would we like to acquire it? In the next months and years, Pembroke will itself be growing, as we occupy the Mill Lane site. Until then, the Yamada Room will be the ideal place for the desk, right beneath the stained glass windows. Looking ahead, we have plans for a handsome new reading room. What could be more inspiring to future generations of Pembroke students and writers than to have Ted Hughes's own writing desk and chair beside them as they read, study, compose? Mark has some sense of that excitement. Having organised that conference, and helped assemble the collection, he discovered in 2012 that for his first five years at Pembroke his study, N8B, had been Ted Hughes's student bedsitting room forty years before. A dream Hughes had there inspired one of his most famous poems, 'The Thought-Fox'. We need your help, in the next two weeks, to fund the purchase. £5000 will see us home. Already an alumnus has pledged £1000. Join him, and help us secure Ted Hughes's desk and chair for Pembroke. 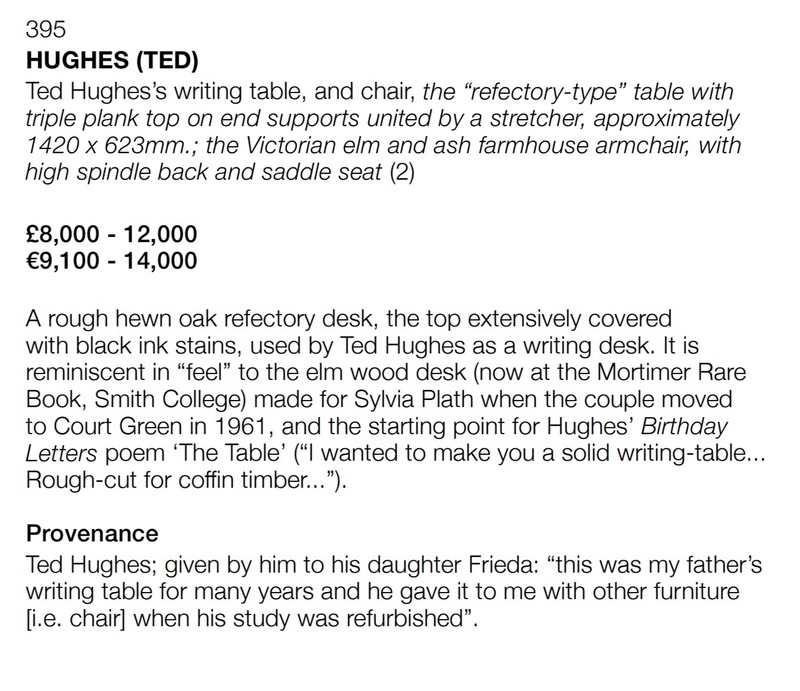 The money will go to the purchase and collection of Ted Hughes's writing table and chair. A personal guided tour of Pembroke's Ted Hughes collection. A chance to inspect the manuscripts and, for gifts of £500 or more, to sit and write at his desk. If you are unable to help us financially at the moment, you can still help us by sharing this project with anyone you think would be interested – on Twitter, Facebook, LinkedIn, by email, telephone, in a chat over the fence or on your blog. Having said that, we’d be so grateful if you did feel able to make a donation towards bringing Ted Hughes’s writing desk and chair to Pembroke. Only with your help will this happen. Pack of six notecards of the beautiful stained glass windows inspired by Ted Hughes's poetry. A morning or afternoon/early evening tour of Hughes’s Cambridge and College, on a mutually convenient date, conducted by Mark and Pat. An introduction to the highlights of our Hughes collection. Lunch or dinner at High Table. A morning or afternoon/early evening tour of Hughes’s Cambridge and College, on a mutually convenient date, including the opportunity to sit and write at Hughes’s desk. Mark and Pat will guide you on a tour of the Ted Hughes collection, including his undergraduate room where he dreamed of a burned fox. You will see a manuscript of The Thought-Fox, four of Hughes’s fishing rods, his pike, George Adamson’s original artwork for The Iron Man, and more. Lunch or dinner at High Table. A signed copy of Mark’s book, The Catch: fishing for Ted Hughes, on its publication. A morning or afternoon/early evening tour of Hughes’s Cambridge and College, on a mutually convenient date, including the opportunity to sit and write at Hughes’s desk. Mark and Pat will guide you on a tour of the Ted Hughes collection, including his undergraduate room where he dreamed of a burned fox. You will see a manuscript of The Thought-Fox, four of Hughes’s fishing rods, his pike, George Adamson’s original artwork for The Iron Man, and more. Lunch or dinner at High Table and a night’s accommodation at Pembroke. A signed copy of Mark’s book, The Catch: fishing for Ted Hughes, on its publication.